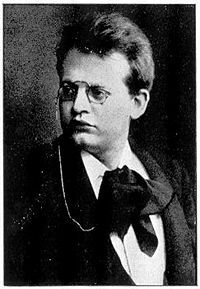 Photograph of Max Reger. Source: What We Hear in Music, Anne S. Faulkner, Victor Talking Machine Company, 1913. Johann Baptist Joseph Maximilian Reger (March 19, 1873 – May 11, 1916) was an extremely prolific German composer, organist, pianist, and teacher, who became a leader as a modernist composer to influence the likes of Arnold Schoenberg, Bela Bartok, Sergei Prokofiev, and Paul Hindemith. Reger's modernistic direction centered in his rich and intricate polyphonic structures, shown especially in his orchestral, chamber, and keyboard compositions. Although it is said that Reger helped to push German music into the twentieth century, he also helped to maintain an earlier German religious heritage by placing the melodies of Protestant hymns into his works, especially in the concertos. Reger's mindfulness of the importance of a spiritual base and reality was his way of helping his performers and listeners to prepare for life in a spiritual world. Born in Brand, Bavaria, Reger studied music in Munich and Wiesbaden, with Hugo Riemann. 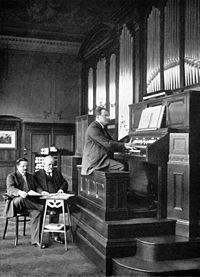 In 1901, he settled briefly in New York, where he taught organ and composition. From 1907, he worked in Leipzig, where he was music director of the university until 1908, and professor of music composition at the Felix Mendelssohn College of Music and Theater until his death. He was also active internationally as a conductor and pianist in that period of time. Joseph Haas and George Szell were among his students. Recording session with Max Reger for the Welte-Philharmonic-Organ, 1913. During a composing life of little more than 20 years, Reger produced an enormous output in all genres, nearly always in abstract forms, although few of his compositions are well known today. Many of his works are fugues or in variation form, including what is probably his best known orchestral work, the Variations and Fugue on a Theme of Mozart (based on the opening theme of Wolfgang Amadeus Mozart's Piano Sonata No. 11, K. 331). He also wrote a large amount of music for organ, including the Fantasy and Fugue on Bach (this piece, based on the Bach motif, is considered one of the most difficult and demanding in organ literature). He was particularly attracted to the fugal form during his entire life, once remarking: "Other people write fugues - I live inside them." He composed music in virtually every other genre, (opera being a notable exception). He was a firm supporter of 'absolute music' and saw himself as being part of the tradition of Ludwig van Beethoven and Johannes Brahms. His work often combines the classical structures of these composers with the extended harmonies of Franz Liszt and Richard Wagner and the complex counterpoint of Johann Sebastian Bach. His organ music, though also influenced by Liszt, was provoked by that tradition. Of his orchestral pieces, his symphonic and richly elaborate Hiller Variations and Mozart Variations are justly remembered. In his chamber music, the lighter-textured trios have retained a place in the repertory, along with some of the works for solo string instruments. His late piano and two-piano music places him as a successor to Brahms in the central German tradition. He pursued intensively, and to its limits, Brahms's continuous development and free modulation, often also invoking, like Brahms, the aid of Bachian counterpoint. Many of his works are in variation and fugue forms; equally characteristic is a great energy and complexity of thematic growth. Max Reger's works were not revolutionary and could be considered retrospective, as they followed classical and baroque forms such as the fugue and continuo; however, he was progressive in his musical works and bridged the periods between the Baroque in expanding on the melodies and harmonies of composers such as Johann Sebastian Bach and the twenteith century in presenting composers such as Arnold Schoenberg his ideas in atonal music. The influence of these forward-looking musical experiments can be heard in his chamber works, which are deeply reflective and unconventional. Liu, Hsin-Hung. "A study on compositional structure in Max Reger Phantasie für Orgel über den Choral, "Hallelujah! Gott zu loben, bleibe meine Seelenfreud!" D.M.A. Dissertation. University of Washington, Seattle, 2004.